You know those recipes you have that you turn to when you need something you know is going to taste fantastic, yet isn’t too hard, and will be pleasing to most? 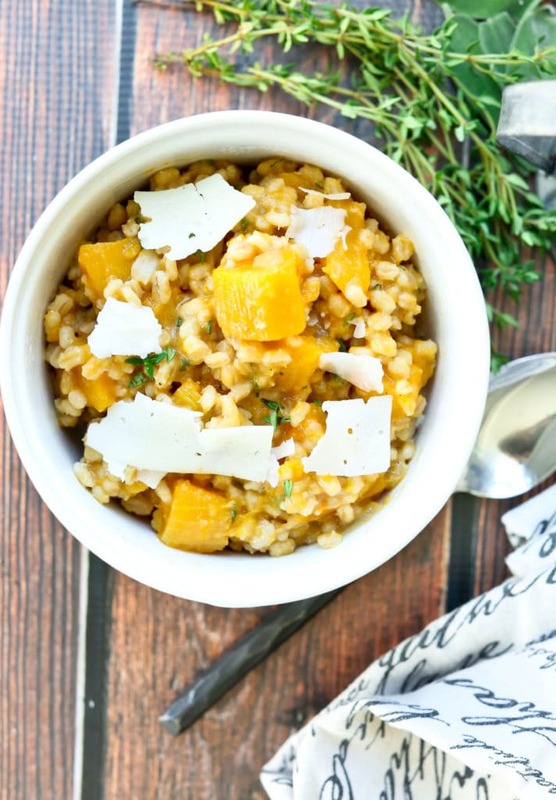 Meet Barley Risotto with Butternut Squash. This is one of those dishes you’ll want to make over and over because it’s perfect for so many occasions. It’s easy enough to be a weeknight dinner (trust me–this isn’t like traditional risotto where you have to stir it for 45 minutes!) yet elegant enough to be a holiday side dish or an entree you serve to company. It’s so delicious, though, you won’t want to save it for special occasions.This recipe can work as a side dish or a vegetarian main. See? Very versatile. If you use is as a main dish, it’ll serve 4 people. As a side, it will serve 8 people. I love the way the pearl barley cooks up so creamy, yet is a much lower glycemic index grain than the Arborio rice traditionally used in risotto. Pearl barley actually has a much lower GI than any kind of rice and most grains in general. Even though pearl barley is processed to have the hull and part of the bran layer removed, so isn’t a fully in tact whole grain, it cooks so much faster than the least processed barley, so I prefer to use it. Note that barely is not gluten-free. 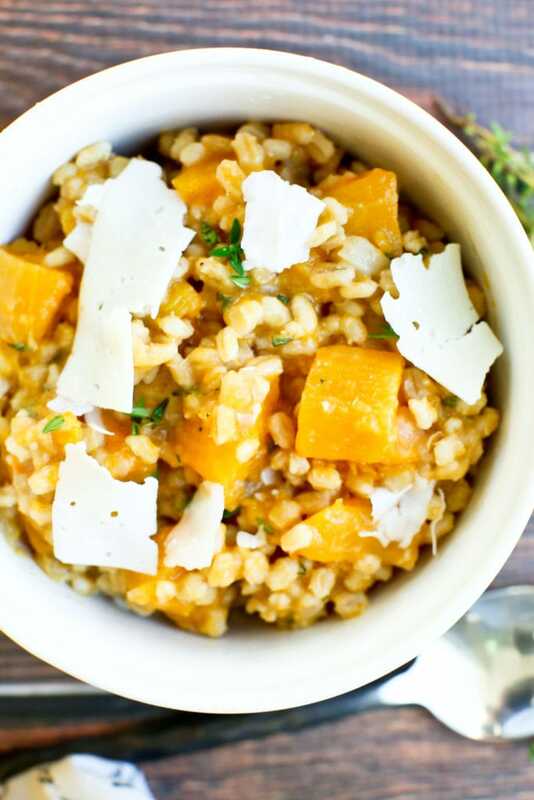 I use the same method to cook this Barley Risotto with Butternut Squash as this Brown Rice Risotto. I start cooking it on the stove, and then move it to the hot oven to finish. Very minimal stirring is required, I promise! 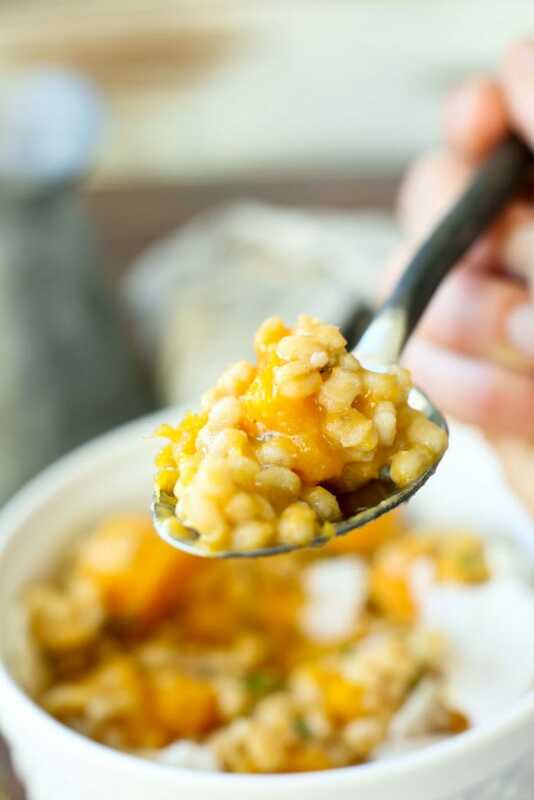 This Barley Risotto with Butternut Squash is one of the most low-stress risottos you’ll ever make, yet the results will impress you. It’s creamy, fresh herbs add incredible flavor, with just the right amount of parmesan cheese. The butternut squash just makes this the perfect dish to make all fall and winter long. 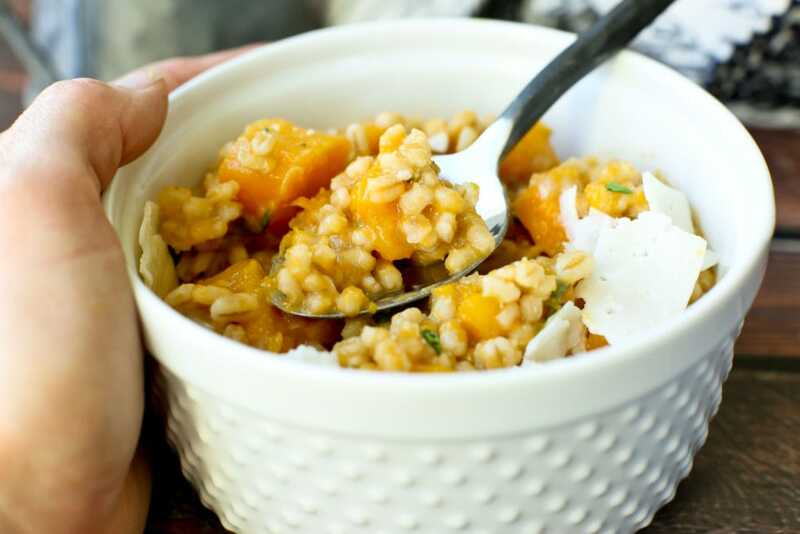 Would you like to know what else makes this Barley Risotto with Butternut Squash a perfect weeknight meal? All of the ingredients can be purchased through Kroger ClickList! Now your grocery shopping and your dinner making are easy, low-stress experiences. Winning. If you missed my post telling all about how much I love Kroger ClickList, you can read about it here. It really is a grocery shopping game-changer for busy moms. Even though I like grocery shopping, my schedule doesn’t allow for the leisurely trips I once enjoyed. If I have to choose between a long trip to the grocery store or being able to cook my family dinner, I’ll choose dinner every time. Thank you, Kroger, for allowing this online shopping experience that makes my life easier! 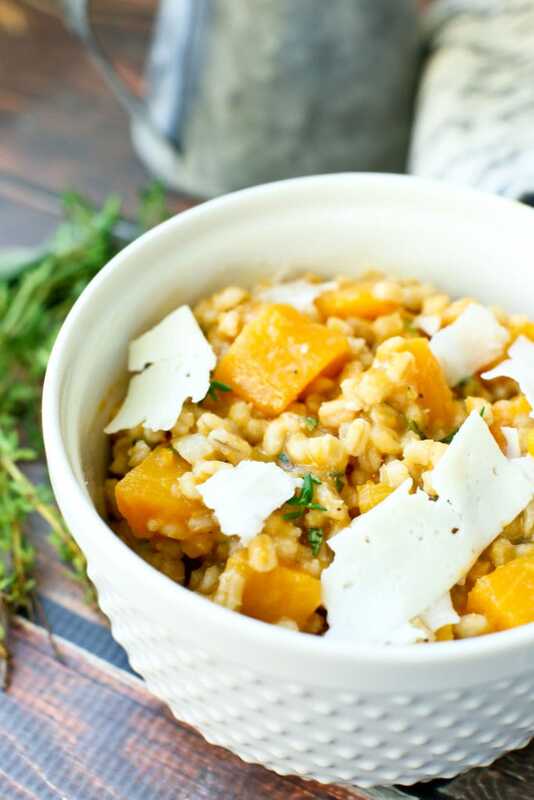 This creamy Barley Risotto with Butternut Squash requires much less stirring than traditional risotto and makes a lovely vegetarian main dish! Heat the oil or butter in a large Dutch oven or oven-safe stock pot over medium heat. Add the onion and butternut squash and cook until the onion is softened, about 5 minutes. Add the garlic, pearl barley, and thyme, stir well and cook for about 2 minutes. Add 4 cups of the stock and bring to a boil. Boil uncovered, stirring occasionally, for 5 minutes. Stir one last time, cover, and transfer to the preheated oven. Cook in the oven for 20-25 minutes, until the liquid is mostly absorbed. Bring the pot back to the stovetop, and over medium heat add 1/2 cup stock, the parmesan cheese, and the sage leaves. Cook for about 2 minutes, then add the last 1/2 cup of stock. Cook an additional 2 minutes, then serve with extra parmesan cheese, if desired. Enjoy! Thank you to Kroger for sponsoring this post. All opinions are my own. The BARLEY RISOTTO WITH BUTTERNUT SQUASH Dish is looking very delicious. It is rich in minerals and proteins. It is rich in Vitamin A and hence it improves eyesight.